E. George MacMinn has demonstrated outstanding achievement and commitment to public service throughout his professional career in law and at Parliament. 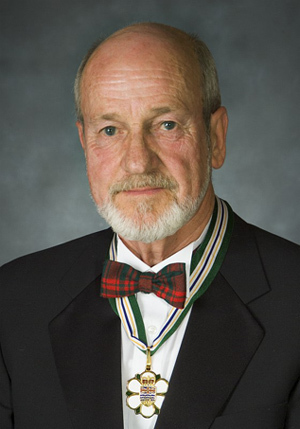 He is the most senior parliamentary officer of the British Columbia Legislative Assembly, and the longest-serving table officer in any Commonwealth Parliament, having served 14 Speakers, 10 Premiers, and hundreds of MLAs over 47 years. Mr. MacMinn is regarded internationally as a pre-eminent expert on parliamentary law, practice and procedure. His book, Parliamentary Practice in British Columbia, is currently in its third edition, and is widely used throughout the Commonwealth. The book is considered the authority of choice in the B.C. Legislature. He was recently invited to speak at Oxford University in England on the Westminster System as it is practiced in Canada. He is an honorary life member of the American Society of Legislative Clerks and Secretaries. Mr. MacMinn has also been a longtime supporter of the Legislative Assembly Internship Program, which provides university students the opportunity to supplement their academic training. Under his leadership, a Public Education and Outreach office was recently established to promote further understanding of B.C.’s parliamentary system to all citizens. Mr. MacMinn has set exemplary standards for fundraising and volunteer work. He has demonstrated his commitment to the community by playing a crucial leadership role in numerous organizations, and by fostering good relations between Opposition Members, Government Members and the media. Mr. MacMinn was appointed to the Queen’s Counsel in 1993, and was awarded the Queen’s Medal for Outstanding Service to the Legislative Assembly in 2003.